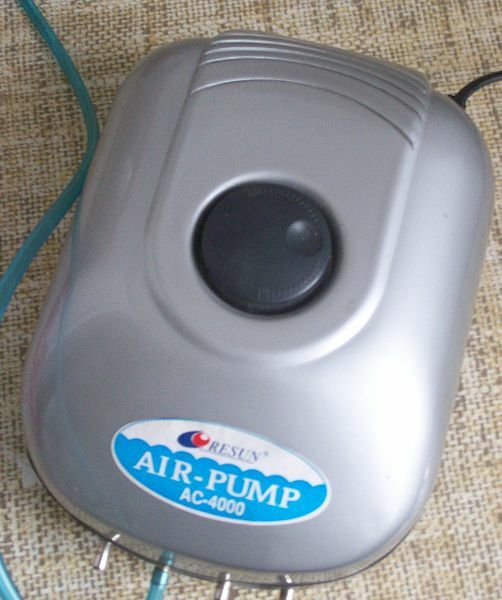 Air pumps are not an absolute requirement for a tropical fish aquarium, but they do have many uses. Simplicity is what to keep in mind with this useful piece of aquarium equipment. When I watch my aquarium full of all my little buddies swimming around and having their daily adventures, my attention always drifts to the bubbles. They are a mesmerizing part of my aquarium community. If for nothing else, an aquarium air pump adds movement to a slow moving tank with tropical fish that like to drift or are hiding in their caves sleeping. But the air pump also adds another key element to your aquarium system, water circulation. Water is going to move around your tank in currents anyway, but much of the time those currents are going to be higher in the tank where the inflow and outflow of your aquarium filters are located. Down on the bottom, where all the interesting aquatic friends are grazing for food and digging out little caves, the water moves slower. This slow movement can sometimes trap cooler water and water that is carbon dioxide rich. An air pump will gently coax this water higher in the tank to were the current is faster, eventually moving it to the surface. The surface is where carbon dioxide leaves the tank and oxygen enters. And, in a nutshell, this is why I like to have bubbles in my aquarium. I can move water off the bottom of the tank in a subtle way. Nope. Air pumps have other uses as well. Some aquarium filter systems, such as the under gravel filter, use an air pump for exactly the purpose I stated above. The difference is they pull the water through the substrate first and then channel it upward via an outflow tube. Some aquarium decorations use air pumps to activate a moving part such as a treasure chest lid or windmill. These aquarium decorations not only look cool, they perform the handy function of assisting water circulation. And one last reason that an air pump is a nice aquarium extra...some fish seem to like it. I have had juvenile cichlids that just loved to do laps back and forth through an air curtain. I swear, I think it tickles their bellies and they take "air showers" for fun. Which one is right for you? Honestly, it probably doesn't matter. Air pumps usually are the cheapest part of your aquarium. Some have multiple ports to put the hoses, some have variable speeds, and some just sit there purring away. The only advice that really needs to be given here it to get one that is powerful enough to move air through all your hose, air stones, bubble curtains, and aquarium decorations. Each piece will add a little resistance. I suggest getting an air pump that is in the mid-range of cost, as they are usually powerful enough to do the job and won't break your wallet. The more expensive ones might be needed if you have a lot of air powered equipment or use an under gravel filter powered by air. Quality usually isn't an issue with an air pump because they are fairly inexpensive to manufacture. Check out our affiliate partner's site for different air pumps and air pump accessories to find what best suits your aquarium plan. To see more detailed information, check out the Wikipedia page on pumps and air pumps.